Restaurant Maïs is finally here. You’ve been waiting for it. Even if you didn’t realize it, all this time… you were craving tacos. Montrealers like myself have long been jealous of the plethora of bone shakingly good tacos Toronto has long enjoyed. Anchored Grand Electric and La Carnita, I have trouble eating anything but tacos whenever I’m in town. 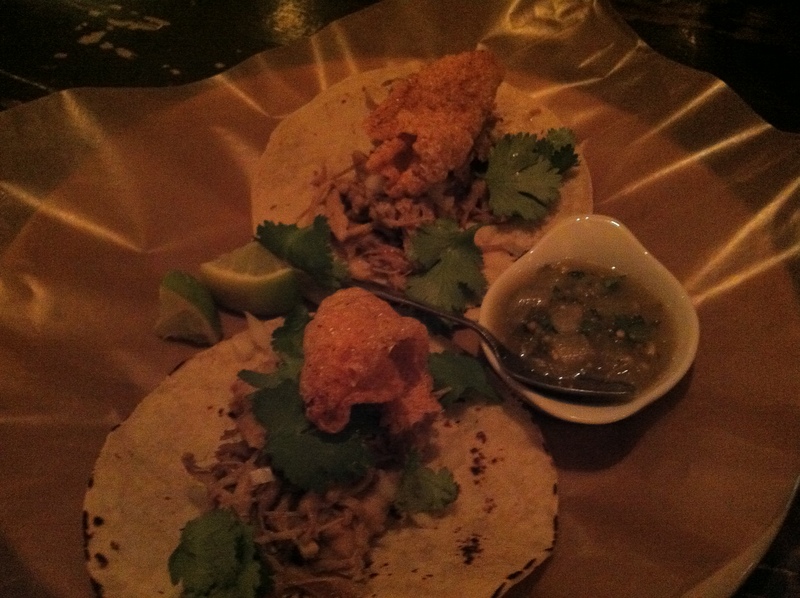 In Montreal, the fantastic Grumman 78 Tacos have been picking up the slack for a long time. But for a long time – there hasn’t been much competition. And we all know that without taco competition – there’s no incentive for TACO innovation! Right? Hold on to your Tecate. Restaurant Maïs is exactly what I wanted in a Taco spot. The interior is wonderfully decorated with a rustic Taquería vibe and a vibrant menu. The requisite extensive Tequila list is there, the Micheladas are there, the TACOS (of course) are there and the mouth watering paletas are there. A Michelada is a mexican drink with lime juice, Worcestershire sauce or hot sauce, pepper, tomato juice and an upside down beer. Unfortunately the night in question Mais was out of bottled beer so we had our beer poured and mixed in ahead of time. The drink tasted great – really spicy and was a good starter before breaking into the stronger Mezcal Old Fashion, Jameson’s neat, Painkiller and Horchata with rum. Note – we loved this place so much we came back a week later and they had already switched up a few tacos on the menu – adding a veal tongue taco to the mix. Taco prices are very reasonable at $3 – $4 each with a great mix of meat, seafood and vegetarian options. The Carnita Taco meat was tender and savory, served with a delightful crunchy pork rind on top and salsa verde – definitely the staple go to choice on the menu. 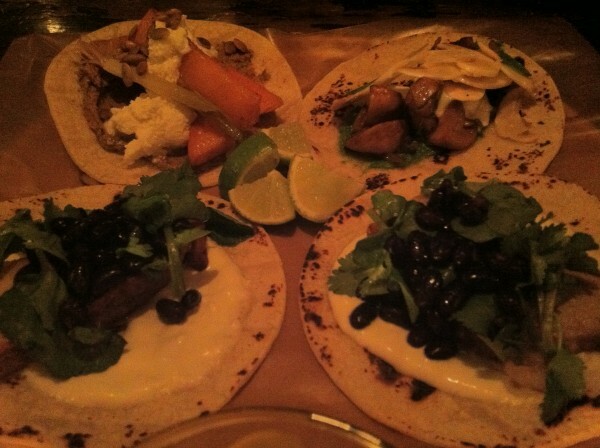 The fatty pork belly taco was hearty and served with black beans. The bass and avocado taco was a surprising favorite with our group and the portion of fish served was generous. The squid taco was served with salsa, fresh lime and onion. This taco was begging for extra hot sauce and tasted really fresh. The mushroom taco and squash taco were great vegetarian options but once the first round was gone we quickly ordered more Carnita and fish tacos. On our first visit we were left too stuffed to try the paletas from La Catrina. We knew what we were missing out on because we had paid a visit to the La Catrina booth at Oysterfest 2012. On our second visit we all ordered the pumpkin marshmallow paletta which tasted like pumpkin pie, ice cream and gooey marshmallow bits – adored by all. Obviously, this spot is the bomb. Right now, it’s cash only and only takes reservations for groups of 8 or more strictly no reservations!. My best advice is to get here soon because this place is going to get very busy, very quickly. Tags: Beer, Ceviche, Cocktails, Mexcian, Montreal, Paleta, Squid, Tacos. ummmmmmmmmmm I WANT THAT! Squid taco YUM! Sounds fantastic. Love Mexican food. 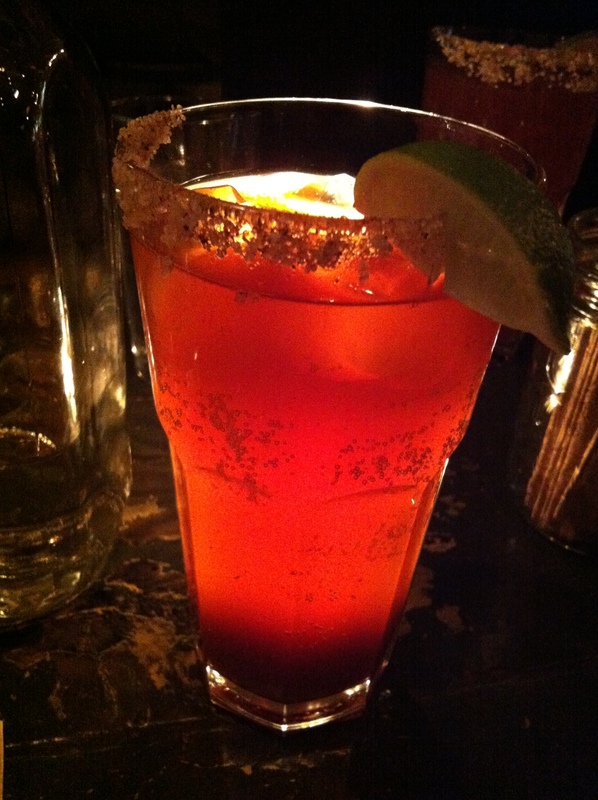 Taco lovers should also check out Taco Tequila on the corner of Sherbrooke and Saint-Laurent – my current favorite! Updated hours + no reservations! Thanks to Mais staff for the tip.